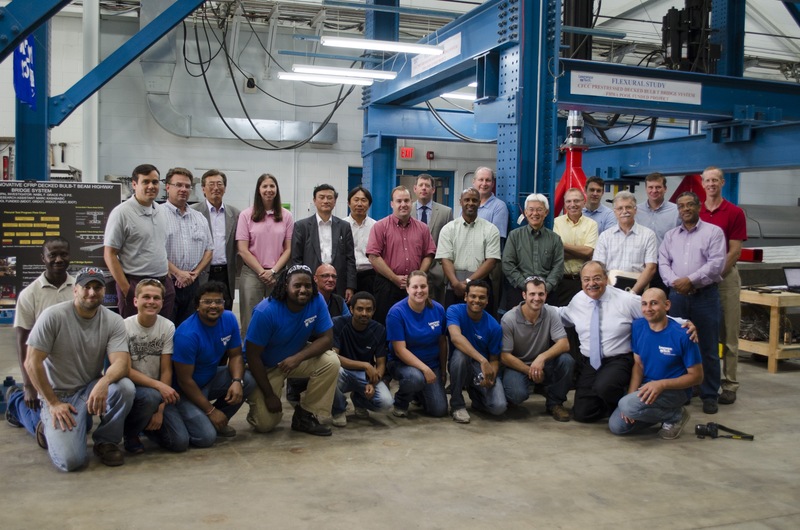 Transportation officials from eight states traveled to Lawrence Tech in June to review the progress on research being conducted at LTU’s Center for Innovative Materials Research under the direction of Dean of Engineering Nabil Grace (kneeling second from right). Transportation officials from eight states recently met at Lawrence Technological University to view progress on a three-year study to evaluate alternative materials and a new design for a new approach to building longer-lasting and corrosion-free highway bridges. The study is supported by a $349,000 contract with the Federal Highway Administration (FHWA) using pooled funds from the state transportation departments of Oregon, Minnesota, Wisconsin and Iowa, in addition to the Michigan Department of Transportation (MDOT), which is the lead agency for the project. LTU Dean of Engineering Nabil Grace and his team of researchers are conducting the study in the Center for Innovative Materials Research (CIMR) at Lawrence Tech. They are developing and testing prestressing non-corrosive cables and ultra-high-performance concrete (UHPC) in a newly developed bridge design that complies with the Accelerated Bridge Construction (ABC) program that the FHWA is promoting. Since 1988, Grace has conducted scores of studies for state and federal agencies that have pointed to the long-term reliability of non-corrosive carbon fiber reinforcement polymer (CFRP) materials as a replacement for steel in concrete highway bridges. Three highway bridges have been built in Michigan and Maine utilizing CFRP materials in place of steel. This year MDOT is constructing two highway bridges on Eight Mile Road (M-102) over Plum Creek that are prestressed and reinforced with CFRP materials. The proposed bridge now being studied at LTU would be both easier to maintain and faster to construct because it doesn’t have a cast-in-place deck slab. The research project includes significant computer simulation that will be used to develop design guidelines to assist state transportation engineers. While at LTU, the state transportation officials witnessed a test that determined the strength of a new type of bridge beam by applying progressively higher levels of pressure until it failed. LTU researchers are testing the advantages of a pre-stressed decked bulb-T beam bridge design compared to traditional side-by-side box beam bridges that have been widely used during the past 50 years in Michigan and other states. The upper flanges of a decked bulb-T beam are wider than those of a traditional I-beam and form the bridge decking after they have been joined with a six-inch UHPC joint. The concrete joint widens to more than seven inches below the deck and is reinforced with two CFRP layers. The predicted result is a bridge system that will last twice as long with less repair work or reconstruction and a significant reduction in the long-term burden on taxpayers, according to Grace. “The ultimate goal is to develop and construct a bridge superstructure system with a service life of 100 years with much less maintenance and fewer construction projects that tie up traffic,” Grace said. This research project is very timely because many bridges built with side-by-side box beams are now reaching the end of their service life, primarily because of corrosion of the steel reinforcement caused by water contaminated with salt and chlorides, the deterioration of the conventional cementitious material used between the beams, and the lack of adequate transverse post-tensioning forces. The numerous freeze-thaw cycles of northern winters speed up the corrosion and deterioration. The use of a decked bulb-T beam cross section would also eliminate some of the inherent problems encountered in inspecting and repairing box-beam superstructures. The decked bulb-T beam cross-section will provide adequate space underneath for periodic inspections and maintenance of critical elements. “Since the safety and mobility of the traveling public is a very important consideration when building or rehabilitating bridges, there is a need to develop a beam type that can be built using ABC – accelerated bridge construction – techniques,” Grace said. • Develop a mathematical model of the proposed side-by-side decked bulb-T beam concrete bridge. • Construct, test, and examine the constructability of a half-scale decked bulb-T beam bridge model with five transverse post-tensioned diaphragms and three control beams (two with CFRP and one with steel). • Determine the optimum transverse post-tensioning level and the adequacy of the number of transverse diaphragms in the bridge model. • Assess the suitability of the system for accelerated construction, part-width construction and bridge deployment. • Develop design recommendations for the deployment of the decked bulb-T beam bridge. The study is also comparing alternative non-corrosive reinforcement materials such as stainless steel and conventional reinforcing and prestressing materials.